The Appium team has been hard at work on something we think the Appium users out there will love. It's a brand new app for Mac, Windows, and Linux called "Appium Desktop": the successor to the old Appium.app and Appium.exe. 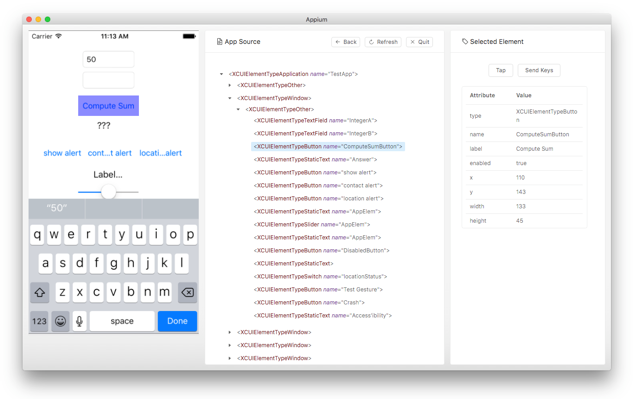 Appium Desktop is a graphical frontend for running an Appium server and starting sessions to inspect your applications. One of the greatest new features of Appium Desktop is the ability to run Inspector sessions on Sauce Labs and TestObject. Simply enter in your Sauce Labs or TestObject credentials, set up the desired capabilities for your test appropriately, and you'll be able to drive your app remotely using Appium Training Desktop. Do you develop on Windows but want access to inspect your app on an iOS simulator? Or want to inspect your app on a real Android device you don't have locally? Appium Desktop's cloud support is a great way to get going.